Chocolate Gooey Bundt Cake what else needs to be said! 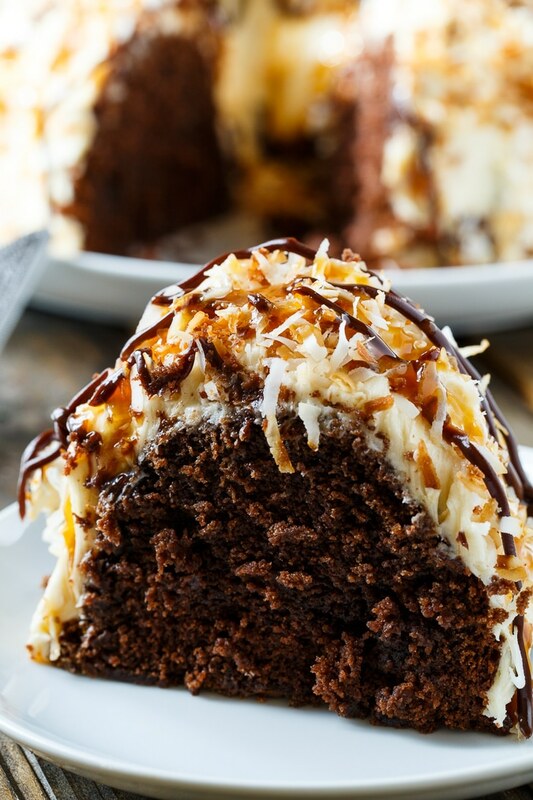 I love caramel, coconut, and chocolate add it to cake and I’m so your friend. So this recipe is a no brainer. It is wonderful and is a hit where ever I take it. Makes a wonderful Holiday or hostess gift. The recipe says to completely cool but I like to finish it and eat while it is just a bit bit warm. Hope you will give this one a try. Beat butter and brown sugar until blended well. Bake at 350 degrees for 55 to 60 minutes or until a wooden pick inserted in the center comes out clean. Let cool 10 minutes in pan then remove cake from pan to cool completely. To make frosting, beat butter and caramel sauce until creamy. Gradually beat in powdered sugar. Beat in enough heavy cream to get to desired consistency.